Need some inspiration to keep little hands busy this summer? 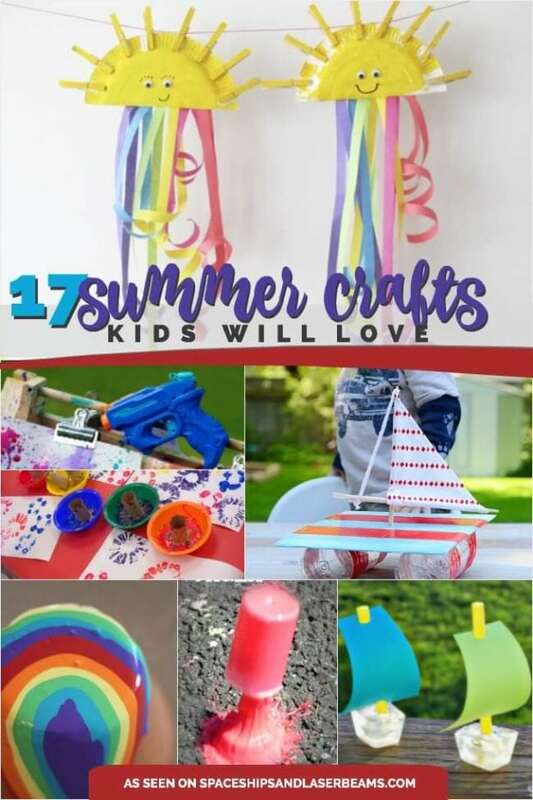 You’re sure to create wonderful memories with these awesome summer crafts for kids! Learn How to Make Sidewalk Chalk and keep the fun going all summer long. Too hot to go outside? Check out 12 Awesome Indoor Activities for Kids they will never tire of. Go nautical with the upcycled boat and ice cube sailboats. Enjoy wildlife with the homemade bird feeder, ladybug sun catchers and swirling, twirling ladybugs. Get messy outside with squirt gun painting, DIY giant bubbles, chalk rockets, TP flower stamps and rainbow flowerpots. Encourage imagination and creativity with ideas like Sharpie dye tee-shirts, rock monster magnets, watermelon puffy paint, marbled paper plate butterflies and paper pinwheels. No matter what summer craft idea you choose first, the kids—and you—are sure to have a great time! Don’t let summer sail away before making this sailboat craft out of mostly upcycled materials. Kids will enjoy rounding up unneeded cardboard, colorful duct tape, 2 empty plastic water bottles, scrap fabric and matching thread, kitchen twine and chopsticks. While this craft is geared for older children, with a little parental help, kids of all ages will enjoy this fun summer craft. Welcome all of the neighborhood birds to your yard this summer with this homemade bird feeder craft. Save up empty toilet paper rolls to upcycle for this project. Gather 6-8” sticks to make perches for the birds. You’ll need a hole punch and string or ribbon for prepping the feeder for hanging. Slather the toilet paper roll with peanut butter and roll in the bird seed. If you really want to thrill your kids with a fun summer craft activity, add this squirt gun painting craft to your summer bucket list. Kids will love filling their squirt guns and water soakers with liquid watercolors and shooting at watercolor paper to create a unique piece of artwork. These Sharpie dye tee shirts combine a fun science experiment with a craft project all-in-one! Mixing primary colors to magically create secondary colors results in a pretty cool tye dye t-shirt. All you’ll need for this great summer craft is red, yellow and blue Sharpie markers, plain white t-shirts, eye droppers, plate, small bowl, 70% Isopropyl Rubbing Alcohol, and a large embroidery hoop. What screams summer more than popsicles? Not much, except maybe melting popsicles? This giant paper popsicle craft is easy and fun and will certainly leave you craving a real popsicle. To get started, round up colored card stock in bright summery colors, glue sticks, scissors, hole punches (squares and circles) and popsicle sticks. Use your creativity to freehand a popsicle shape and decorate using the supplies gathered. Go real crazy and make several paper popsicles! An art project involving puffy paint is always a favorite and is definitely a perfect summer craft for kids. To make watermelon inspired puffy paint, you will need Barbasol shaving cream, Elmer’s glue, & food coloring. If you think the puffy paint looks cool when first made, just wait until it hardens. If your kids love blowing bubbles, making giant bubbles with this DIY bubbles recipe is a summer must. Two of the secret ingredients are glycerin and Dawn Dishwashing Soap. And, you’ll need to make the giant bubble wand too, but don’t worry—it only takes a few materials and can be finished in just a few minutes. Get ready to have a blast with your kids this summer with this exciting chalk rockets craft! To make these exploding chalk rockets, you’ll need water, cornstarch, food coloring film canisters and Alka-seltzer. Kids will love watching their chalk rockets explode and will equally enjoy seeing the resulting sidewalk chalk art. Egg carton crafts are pretty awesome because upcycling is awesome! These egg carton mini copters might just be one of the coolest egg carton crafts I’ve ever seen. Save up your egg cartons and get ready for some summer crafting with your kids. You’ll need to help a little on this one, but the supplies are simple: scissors, paper, marker, paintbrushes, paint, egg cartons, brad clips, craft knife and cutting mat. Kids will go crazy over this summer craft that involves using shaving cream and paint to create marbled paper plate butterflies. The marbling technique is so easy and fun! After marbled paper plates have dried, a few simple cuts are made to create the butterfly wings. Some basic craft supplies are needed to finish off the look (pipe cleaners, googly eyes, craft sticks, markers, glue gun, scissors). Chances are good that you already have all the supplies you need in your craft stash for making these tin can windsocks. What a fun summer activity to do shortly before the 4th of July! Save and wash your tin cans (baby formula cans work great), before giving them a nice coat or two of blue spray paint. Add some white vinyl stars to brighten it up. Parent supervision is needed when it comes time to glue gun on the red and white ribbons. This fun swirling twirling ladybugs craft makes for a fun summer project and party decorations! Creating these 3-D ladybugs may look hard, but they are made easily from two paper circles cut so they can intersect. A little paint for adding details and a pair of googly eyes later and you’ve got some pretty cute paper ladybugs! When the summer heat is really sizzling, keep kids busy and cool making ice cube sailboats. This craft is easy enough that kids can do most of it by themselves. Fill an ice cube tray with water. Before it sets completely, place one half of a straw in the center of the ice cube boat, keep it as centered as possible. Return the ice cube tray to the freezer until completely set. Add construction paper masts to each ice boat prior to racing them in water. Not all summer days are sunny. This sunshine and rainbows paper plate craft would work well for one of those cloudy summer days, where heading outside may not be an option. Prep materials for this sunshine and rainbows paper plate craft. Dye rice blue using a little vinegar and food dye to represent the drops of rain. Cotton balls can be used as clouds. Try out this pour painting technique to create a beautiful rainbow flower pot. You’ll need 6” terra cotta pots and acrylic paint. Turn your pot upside down and you are ready to paint. This technique is so easy! All you have to do is squirt paint directly in the middle, on top of the pot. Paper pinwheels are almost as fun to make as they are to play with on a summer day. Only a few supplies are needed to make this classic craft—a ruler, hole punch, scissors, stamp, pencil with eraser, thumbtack, and text weight paper. Some paper stamping, folding, cutting and hole-punching later, and you’ll have paper pinwheels for playing. Recycle those toilet paper rolls for another great summer craft project for kids! A few cuts with the scissors can transform that tp roll into a flower stamp. Add some colorful paint into shallow bowls, and your kids will have fun dipping their tp roll flower stamps into paint before stamping it onto white cardstock.